Does Mom say she feels too weak to exercise? Does Dad run out of breath just walking down the street? People dealing with COPD often believe that exercise will make things worse. Actually, in moderation, quite the opposite is true. Very real benefits. Even people with severe COPD can become more physical. Something as simple as arm lifts or singing can improve breathing and reduce fatigue. Exercise also helps with the fuzzy thinking many older adults experience with their COPD—because it gets more oxygen to the brain. Plus, people who engage in physical activity even just three times a week have been able to reduce the severity of COPD flares. If they have to be hospitalized, they get home sooner. Best of all, it’s not that hard to achieve these improvements. Ask for pulmonary rehabilitation. The doctor may be able to prescribe a special exercise class for people with COPD. Exercising under supervision supports your loved one to feel safe. A class also presents the chance to talk with others who face the same challenges, which helps combat the isolation and depression that are common with COPD. ask to be trained on “pursed lips breathing.” This technique makes it easier to exhale deeply and bring in enough oxygen. Does better breathing feel impossible? 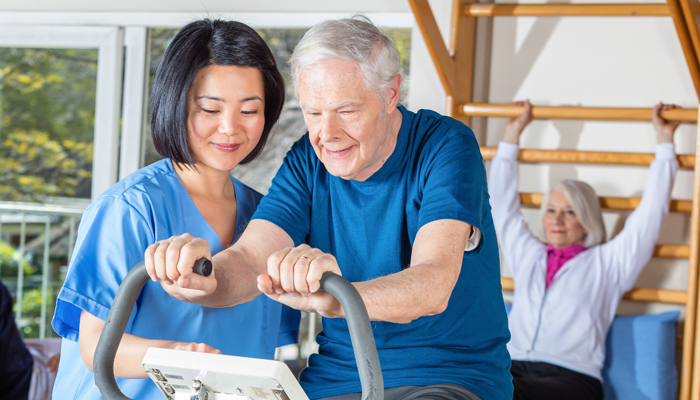 At Gentle Shepherd Hospice we have seen how people with COPD who didn’t think they could exercise can actually improve their breathing with very light, supervised activities. Even a physical therapist coming to the home a few times can guide your relative to exercises that can reduce that scary feeling of air hunger. Give us a call at 1-800-789-0586 (toll-free). As the Roanoke and Lynchburg experts in family caregiving, we can help you get the support needed to make each day the best it can be.